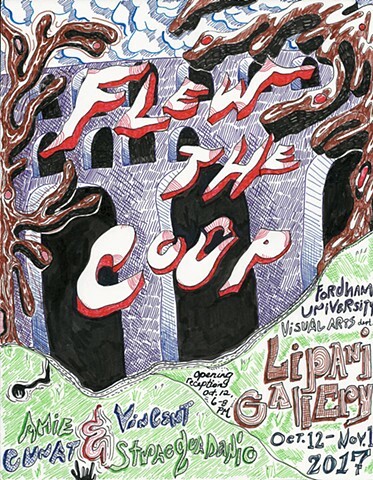 The Visual Arts Department of Fordham University is pleased to announce, Flew the Coop, a two-person exhibition of new paintings by Vincent Stracquadanio and Amie Cunat. The opening reception will be held at the gallery on Thursday, October 12, 2017 from 6:00-8:00 in the evening. The artists will also host a launch reception for their zine edition, Underpants. The zine includes a series of collaborative drawings by Cunat and Stracquadanio. The originals drawings are exhibited on the gallery’s project wall. Focusing on thematic overlaps within their respective work, the exhibition addresses the artists’ reflection on empty sites where humanity Flew the Coop, and only what is displayed through painting remains. As a result, the viewer becomes a participant in this larger narrative by looking, searching and finding the idiosyncrasies and humor implicit in the artists’ work. Cunat’s wall painting The birds of tin covers the gallery walls with an ashen landscape reminiscent of Bowser’s haunted castle and fish tank props of ruined civilizations. Its horizon line circumnavigates the gallery interior dipping and rising according to Stracquadanio’s canvas works. While Cunat addresses an exterior scape, Stracquadanio’s paintings describe a range of richly decorated, baroque interiors. Stracquadanio constructs the paintings as if the viewer is positioned as if peering into a space. In Myth Ray Um #1, you are situated to peer upwards at a vast ceiling depicting vegetation, figures, and mountain ranges. In other paintings, you feel as if you are walking along a corridor or peeking through a window-like vacancy. Stracquadanio’s paintings resemble architectural spaces comprised of visual references to the artist’s personal history. His sources range from the patterning on Sicilian ceramics, the narratives depicted through paintings inside his neighborhood Catholic church, the fig trees in his parent’s back yard in Queens, and to a pizza box from a local restaurant in New Haven. Although the work alludes to biographical experiences, the artist also wishes to maintain a sense of mystery or the indeterminate in a painting’s narrative. He compares his work to the experience of visiting a Mithraeum ruin (a meeting place for an ancient Roman cult dedicated to a Persian deity named Mithras). Throughout Europe, Mithraeum ruins all share the same visual iconography—such as a man adorned with a floppy hat sacrificing a bull or a man being born from a large boulder. A visitor may try to infer their own connections or associations from these cues in service of a larger story, but their true meanings are uncertain. Cunat’s work reveals parallels between abstraction and perception through paintings and installation. What began as an observation becomes a painterly image that is of the original experience. Recently the artist has been drawing various churches or buildings in her Lower Manhattan neighborhood, then translating these sites into site responsive wall paintings. The once structural buildings adopt biomorphic tendencies in the paintings, and their contours bend as if their frames have been pulled out, leaving behind the suggestion of a jelly-like skin sagging from its own weight. Other forms maintain a sense of buoyancy and appear to sway with a larger atmospheric force that pushes this imagined landscape into contorted positions. Vincent Stracquadanio (b. Queens, NY) earned an MFA from Yale University and a BA from Fordham University. He has exhibited his paintings at Field Projects (NY), Green Hall Gallery (CT), Trestle Gallery (NY), Public Address (NY) and ArtHelix (NY). He is the recipient of the First Year Gamblin Paint Award in addition to the James Storey Memorial Visual Arts Award. He lives and works in New York, NY. Amie Cunat (b. McHenry, IL) received an MFA from Cornell University, Post-Baccalaureate Degree in Painting and Drawing from The School of the Art Institute of Chicago, and Dual BA in Visual Arts and Art History from Fordham University. Her recent exhibitions include The Clock is Taking a Nap, at Knockdown Center (NY), Curtains at This Friday or next Friday (NY), Hideout at Wave Hill (NY), and Clue, Cue at Foley Gallery (NY). She has participated in numerous residencies including The Studios at MASS MoCA (MA) and Guttenberg Art STAR Program (NJ). She lives and works in New York, NY. Both artists are Fordham University Alumni and currently teach Painting and Drawing in the Visual Arts Department.